For those of you participating in the Summertime Sampler Block-of-the-Month through Sew Sweet Quilt Shop, along with this month’s block, I’m giving you some of my appliqué hints and tricks, to help you with the appliqué portions of the traditional version of the quilt. 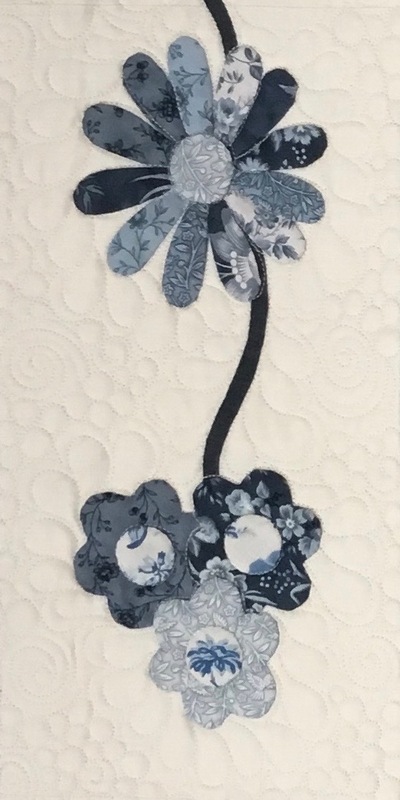 If you’d like to learn directly from me in person, I’m teaching a class at Sew Sweet Quilt Shop this Saturday, November 10th, so while you’re there to pick up your block, you can just stick around and work on the appliqué all afternoon with me! The class fee is $20, and is open exclusively to participants in the Summertime Sampler BOM program. We’ll be stitching from 1:00-5:00 pm at the shop. There are still some spots open, so if you’re interested, call the shop at 660.548.3056 and sign up. They’ll give you a supply list when you sign up, and you can get a good start on the appliqué portions of your quilt during class! 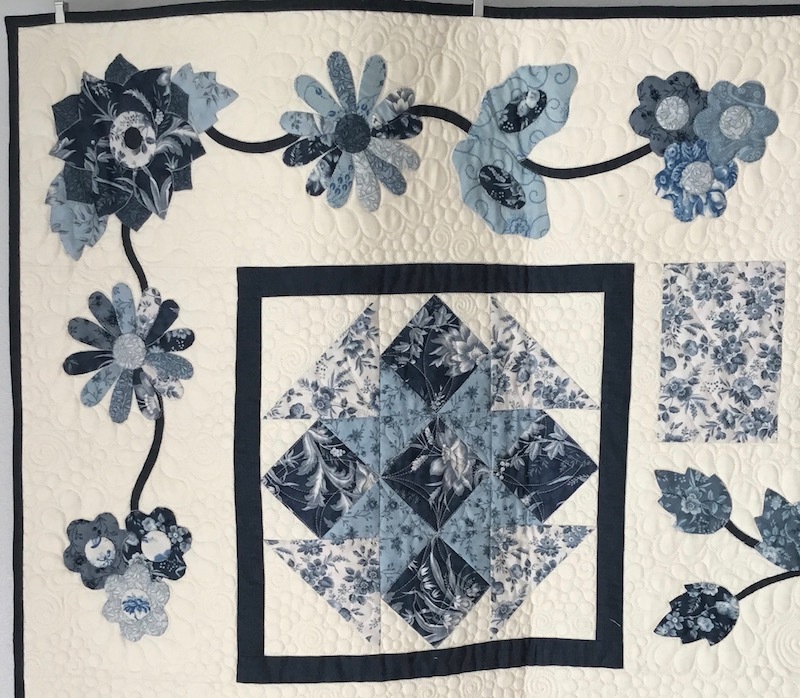 If you can’t be there Saturday, or if you’re doing the BOM long distance, read on for some links to tutorials I’ve written, and for some other hints specifically for this quilt that may help you. First, we’ll talk about the fact that there are some sections of the appliqué in this quilt that go around a corner. This means that there are two pieces of background fabric that get joined at some point. The pattern tells you when it’s a good time to complete each section during the assembly, but I like to do as much of the appliqué as I can before I sew those pieces into the quilt. Section A goes across the top, so you could complete all the appliqué except for the large corner flower before you ever sew that section into the quilt top. It makes it easier to handle a smaller piece than having to manage a larger section of the quilt while you’re trying to appliqué. Then, you could also do as much of Section B as possible before sewing it into the quilt top. Once you’ve done as much as you can without that seam being sewn, it’s time to do that part of the assembly, then you can complete that little bit of appliqué that you had to leave undone because the vine overlaps the seam. If you need help with all the basic steps, I have some in-depth step-by-step tutorials that show you how to prepare your patterns, use the templates, prep your pieces, and make your stitches as invisible as possible, along with some other tips as well. Click the links below to find that information. For a quick basic tutorial, here’s my “How To Appliqué a Leaf” tutorial. And for help with those flower centers, this “How to Applique Perfectly Round Circles” tutorial should help. For all the pieces that are alike, you only need to make one template. For instance, on those flowers with all the individual petals, I made one template, and cut all the petals using that one template. They do not have to be individual templates for each petal. That’s all I can think of for now. I’ll of course be offering up lots of other little snippets of appliqué advice in the class on Saturday that just come to me in the moment (haha! ), and you’ll get to watch me demo all these steps in person, but if you can’t be there, and you have any questions, don’t hesitate to ask, and I’ll do my best to answer! When can I get the fabric to start the appliqué? I’m ready to start!